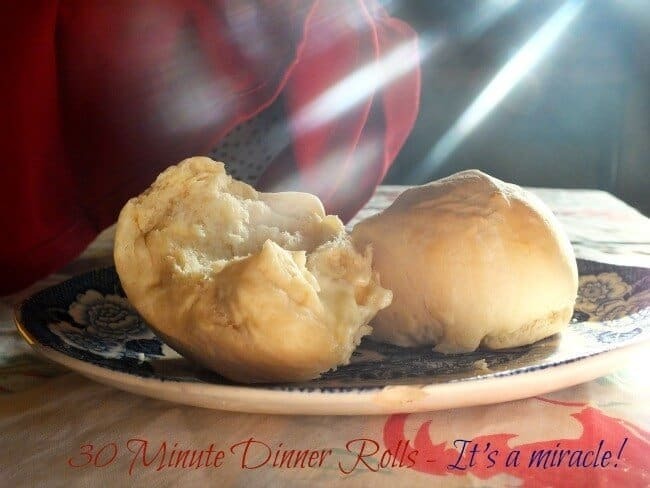 If you are looking for super quick dinner rolls then your search can stop right here. You can make these rolls, start to finish, in a little less than 30 minutes. 30 minutes, y’all. One episode of New Girl. 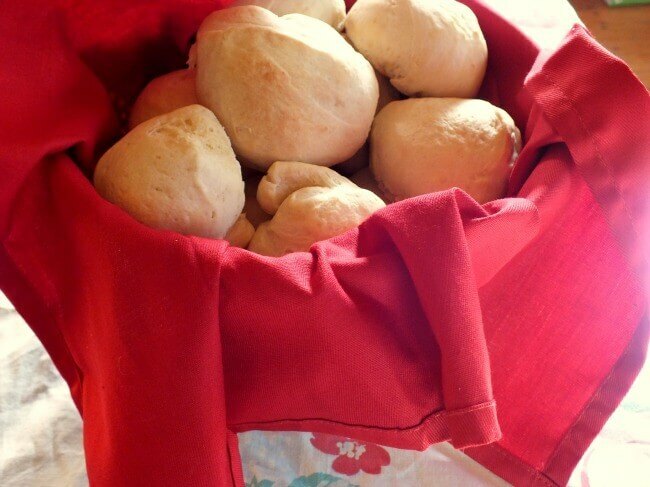 I have been testing recipes to see how fast I could get fresh dinner rolls on the table. My life is super busy right now and I bet yours is, too. It seems that the kids get home from school and it’s a chaotic race to get food on the table before karate, church, or whatever happens to be on the agenda that night. At the same time I am not a person that can handle a meal that I think isn’t balanced. I like to have a starch, a protein, and a vegetable at dinnertime. Dinner rolls are just so comforting, I think. There is something about them that adds an extra touch to the meal and seems to radiate love. The thing is that they usually take about 3 hours. Ain’t nobody got time for that. I tried about three recipes and worked and tweaked each one but I always felt that they were too dry, too dense, or just not quite right. I finally came across a recipe at The Rehomesteaders that was nearly perfect. I just wanted a little more fluff and airiness. And, you know, I never can leave anything the way I found it. After reading through some of my very old cookbooks I found that there were ways the older generation had sped things up to make quick dinner rolls. It makes sense, I mean if anything those pioneer women were busier that we are. Their secret was using buttermilk and adding a little baking powder. I’d suggest making this recipe according to the original at the Rehomesteaders, too. That way you can see which you prefer. The rolls have a crisper crust when made with water and a darker crust and more delicate crumb when made with the buttermilk. It’s nice to have a choice, isn’t it? While I was making these I took pictures of the clock at every step so you can see how long it took. I will admit that it took me close to 50 minutes to complete but keep in mind that I was making notes on ingredients and snapping pictures as well. I would say that anyone could make these in 40 minutes for sure and probably 30 once you had some experience at it. For best results keep everything warm. 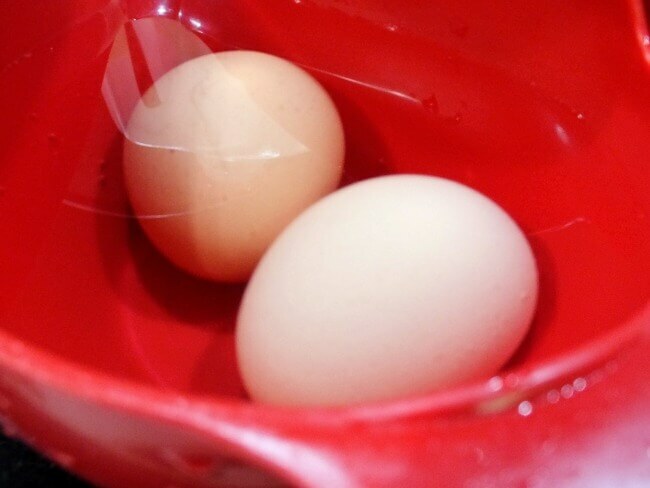 I warm the eggs in a bowl of warm water before I crack them. The buttermilk is warmed – everything should be room temperature at the least or a bit warmer. Rising time will vary according to how warm the room is – you might want to give these a bit more time in the winter. Also, keep the rolls small – shape the dough into the size of golf balls or so. I made them larger and that’s why it took an extra five minutes to cook. I just want to add that, while these are awesome, when you speed things up you lose a little something in texture. Please don’t expect these to be an exact replica of your 3 hour rolls. Ready? Here’s a quick visual … Skip the images if you want to go straight to the recipe. At 5:10 I began to mix the ingredients. Always warm the eggs to room temperature before using. I cover them with warm water while am waiting for the yeast to finish proofing. I was making notes and taking images so it was 5:24 before I got back to the yeast. At this point I mixed in the rest of the ingredients. 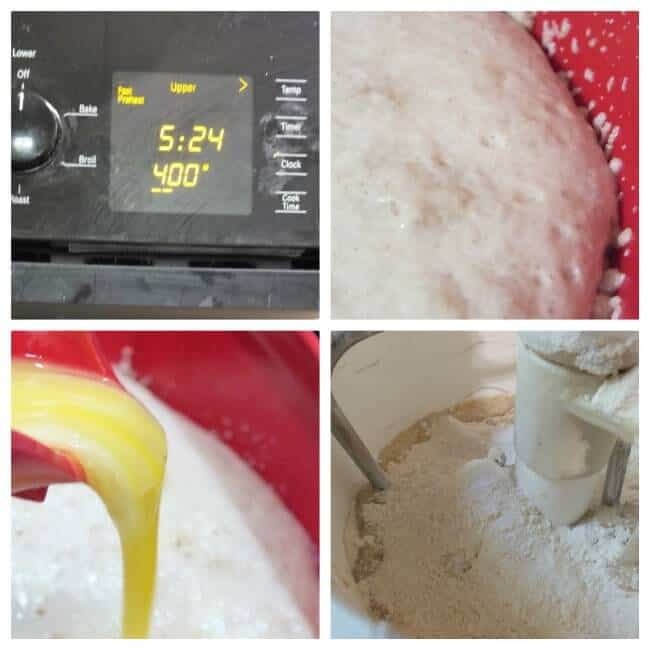 I mixed the quick dinner rolls dough in my bread mixer. I love my Kitchenaid for cakes and pastries but I prefer a Bosch Universal Plus for bread items. This is NOT a Bosch, it’s my old-old-old K-tec. I’ve since upgraded… 🙂 It makes a great Christmas gift, it will last forever, and I really do love mine. I keep the rolls even by cutting the dough in half, then cut the halves in half and so on.You can shape the rolls at this point or, if you really want to save time, just put them on the baking sheet. They won’t be as pretty as the shaped ones but it will save you probably 5 minutes. Melt the butter and then brush the rolls just before you put them in the oven. Give them a try and see for yourself. After all, it’s only 30 minutes! If you want to save even more time you can make a double batch and freeze the excess. O.k. set your timer and go! Hot, buttery yeast dinner rolls are nearly impossible to serve with a weeknight dinner... until now. How about light, fluffy rolls that you can have steaming hot and on the table in just about 30 minutes? 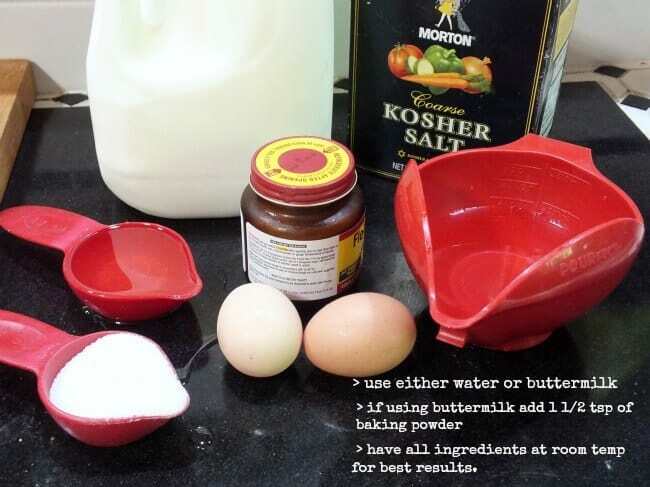 Beat the eggs slightly and add them to the yeast mixture with the buttermilk, salt, oil, and baking powder. Pour the whole mixture into a mixing bowl fitted with the dough hook. 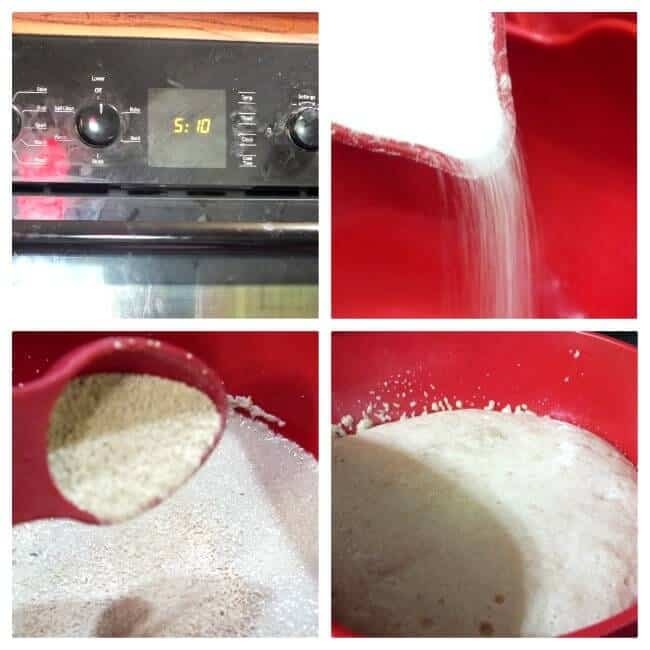 Check to see if the dough is too sticky and add more flour if necessary. Turn the dough out and knead lightly just to pull it together. Cut it into 18 - 24 equal pieces and shape quickly into rolls. Arrange them on a lightly oiled cookie sheet. Let rise in a warm place for 10 minutes. Bake at 10 minutes, or until done. Brush with melted butter, again. awesome! i love fresh rolls!!! Haha. One episode of New Girl. I love it. Yay for quick and rolls with butter!